You’ve heard it once, and you’ll hear it again: Shop local! The holiday season is the perfect opportunity to give loved ones gifts while supporting the local makers and entrepreneurs that make this city so buzzworthy. There’s a huge pool of spots to shop at, so we thought we’d help with a local gift guide. 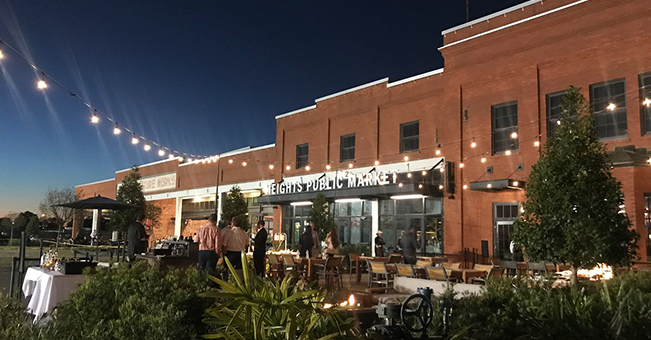 Of course, you’ll be able to shop at tons of local vendors during the Tampa Indie Flea at Armature Works on Sunday, December 16. The shopping extravaganza begins at 11am and runs through 3pm. Don’t see your favorite local business included? Let us know in the comments and we’ll be sure to add them in! Indulge in all things adorable at Tampa’s premiere zoo and learning center. The local spot is home to a pygmy hippo, rare African painted dogs, the greater one-horned rhinoceros and the Florida manatee, among other species. The zoo even offers guests the opportunity with up close encounters with the beautiful creatures they aim to protect. ZooTampa at Lowry Park is operated by the Lowry Park Zoological Society, an independent 501(c)(3) charitable organization committed to excellence in education, conservation and research. The Zoo is accredited by the Association of Zoos and Aquariums (AZA), and is featured among the “Top 25 Zoos in the U.S” by TripAdvisor. For a limited time, you can get $10 off single admission tickets. Click here to purchase yours. ZooTampa is located at 1101 West Sligh Avenue. The year-round sunshine is one of the best parts of our beautiful home, but one of the worst for our cars! While we may enjoy the sunshine, we don’t love hopping into a hot car. So we’re keeping our cars cool with a little style. These custom That’s So Tampa sun shades feature designs that show off your love for Tampa. The sun shades are custom fit to your car’s make and model, so the fit is fantastic. Plus they can keep your car up to 40 degrees cooler and reduce dashboard sun damage 100%. You can purchase yours online by clicking here. Use code THATSSOTAMPA to get 10% off for Christmas! This restaurant is a beloved local gem. It’s been in business in Tampa way before it was cool. The restaurant makes arguable the best pizza in the city, and they even offer a vegan Chick’N parmesan that will make an herbivore of you just yet. Treat a loved one to the gift of locally made gourmet Italian food with a Bella’s Italian Cafe gift card. Now, when you buy a $100 Bella’s gift card, you’ll receive an additional $20 grazie card just for you. Click here to purchase yours. Bella’s Italian Cafe, 1413 South Howard Avenue. The Tampa Theatre is a downtown icon. For more than 90 years it has brought the magic and gravitas of cinema to our city. It continues to do so by hosting major concerts and guest speakers (i.e. Damien Rice, George Saunders, Karen Kilgariff) in addition to screening some of the top indie and box office hits. Love old school cinema and cult classics? Tampa Theatre hosts a variety of special screenings so you can recapture the magic of some of your all-time favorites. Side note: This theatre has the best movie theatre popcorn in the country. You can purchase gift cards online. Kahwa is a longtime sponsor of the blog — and a business were so proud to see grow in this city. With more than a dozen locations across the state. Their coffee is basically the reason we wake up in the morning. You can shop for their local roast, their gift cards and some other holiday swag on their website. Through December 25, you receive and extra $5 for every $50 in gift cards you buy. Want to put a smile on someone’s face? Show up to the holiday party with a 24-pack of brightly decorated minis. These delicacies are topped with Fruity Pebbles, cookie dough, cotton candy Pop Rocks, bacon, Cinnamon Toast Crunch and a host of other toppings. The doughnut shop also takes custom orders if you’d like to give these sweet treats a personal touch. Bears, bats, sharks and lions on bicycles. The designs are simple, fun, and look amazing under a blazer. We’ve been mildly obsessed with the designs for years and we find ourselves impulse buying their latest releases on the regular. Their shirts make for excellent stocking stuffers, or a treat for your trendy friend. You can shop their designs online. 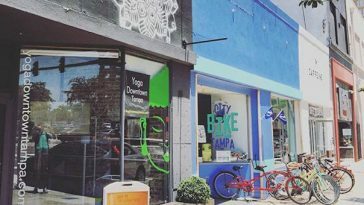 The shop also pops up at indie fleas across Tampa Bay. You can see where they’ll pop up next by following Dark Cycle on Facebook and Instagram. Know anyone who loves to ride bikes? Then a Coast Bike membership is kind of the perfect gift. The organization has dozens of hubs across Tampa Bay. You can cruise between the best museums in St. Pete without breaking too much of a sweat. An annual membership to Coast Bikes costs $79. This plan includes 60 minutes of riding time daily. Monthly plans are available at $15 per month if you want to test the waters before diving into the program. Need a little help coming up with a witty message for a friend or co-worker? The cards and designs by Humdrum Paper Co. come etched with just the right amount of humor and a whole load of style. The company pops up at local markets on the regular — and their greeting cards are a consistent hit. You can shop their designs on their website, and follow where they’ll be next on Instagram. Who doesn’t love popcorn? Seriously? Every flavor Chef Inspired Popcorn comes up with is phenomenal. From sweet birthday cake and salted caramel popcorn to savory maple bacon and garlic parmesan, their list of inventive popcorn varieties is refreshing. All of their flavors are made with passion in Tampa Bay and we can’t think of a better gift than a giant tin of their latest creation. You can order tins online on Chef Popcorn’s website. Time for some shameless self promotion. We make tees, tanks, beach towels, totes and more all with designs inspired by the city of Tampa. So if you’re looking for a mug or a sweatshirt to showcase that Tampa pride, or share it with a loved on, we’d be delighted if you browsed through our shop.